We’re pleased to announce that WP Job Manager 1.31.0 has shipped! You can download the latest release here or head over to Dashboard → Updates to update your plugins from inside WordPress. Please note: While we have thoroughly tested this release, it’s always possible that we missed something, so we strongly advise you to test the update yourself on a staging site before updating your live site. Please note that in order to support the REST API and some upcoming features, we’re bumping the minimum required version of WordPress to 4.7. 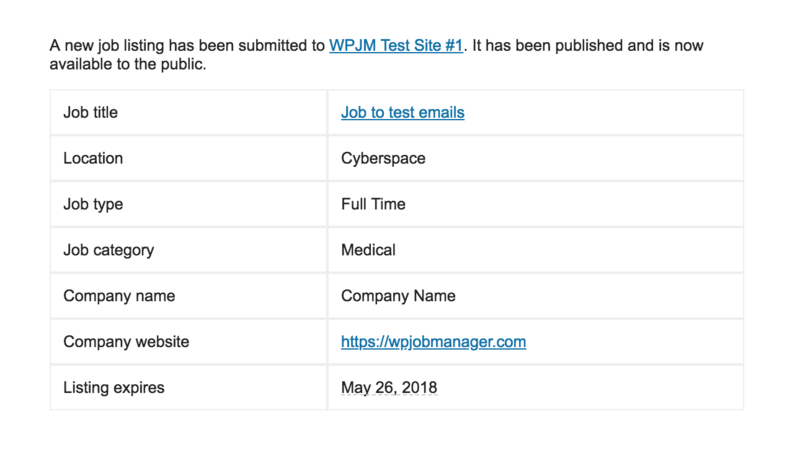 What do you think of the latest release of WP Job Manager? Let us know in the comments! I’m curious as to what the new email notification look like, any examples? I’m not expert but I don’t think that makes it GDPR ready. Shouldn’t it be “per user” request? There should be a way for each user to delete or request deleting ALL of his data collected via WPJM and it’s add-ons, not to just wipe out whole plugin. There are still some GDPR changes to come, including deleting a specific user’s job listings. I’m just updating now. Must all the notifications go to an admin. Can we send them to a specific email address instead? At the moment there isn’t a direct way to do so! Currently, notices of expiring jobs can also be sent to employers. Would you mind clarifying which emails you would like to send to whom, and for what reason? Thx! For the GDPR regulation, how did you conform the use of ADD ON “Resume Manager” “Job ALERT” and “APPLICATIONS” plugins? Hi Bianca, I’ve replied to you via email, but I’ll respond here as well, for the benefit of other readers. There may the third-party plugins that could accomplish user deletion (and user data deletion) for you. Note that though the “Delete Data on Uninstall” option implemented into WP Job Manager core won’t delete users, it will take away their employer or candidate role. Database information is all stored in wp_posts and wp_postmeta for Resume Manager and Applications, so using a third-party plugin as mentioned above, or going through and removing user resumes and applications will delete that user data. It may get a bit tricky in the file uploads if you try to remove them after you’ve deleted resume and application data, so we’d recommend removing file uploads first. Job Alerts don’t involve any file uploads, so there’s nothing to worry about there. YouTube support would probably be able to answer that for you more satisfactorily than we could. The current forms allow me to add check boxes but I can’t add a link to the privacy page as the fields strip out any html.